Drs. 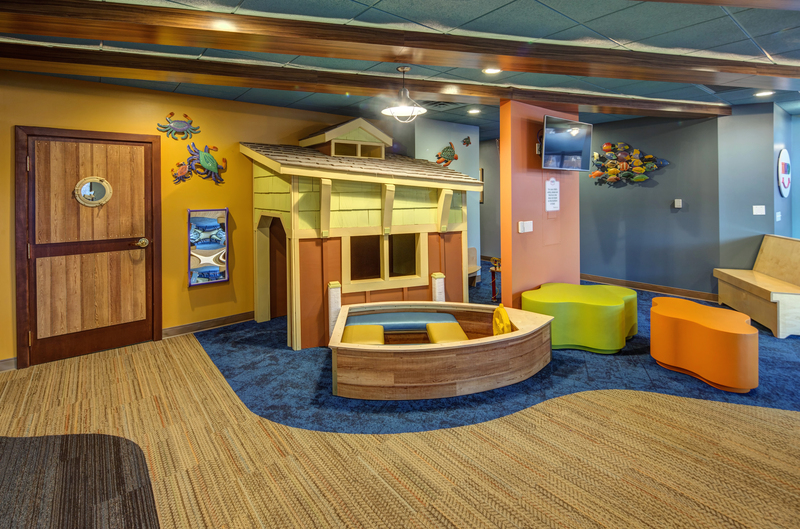 James Van Wingen and Matt Mandeville of Northern Michigan Pediatric Dentistry wanted a practice design that suited their love of exploration and the natural beauty of the surroundings outside. Boy, did they ever get it. Traverse City, Michigan, is a place of stunning natural beauty, and Drs. James Van Wingen and Matt Mandeville have done their best to ensure that the town’s interiors well, those of their practice, Northern Michigan Pediatric Dentistry, at least- are spectacular as well. A miniature boathouse and rowboat, a tall wooden giraffe, animal masks, three-dimensional fabric “boats” suspended from the ceiling, a butterfly wall and everywhere a riot of rich colors greet youngsters arriving for their appointments. A miniature boathouse and rowboat, a tall wooden giraffe, animal masks, three-dimensional fabric “boats” suspended from the ceiling, a butterfly wall and everywhere a riot of rich colors greet youngsters arriving for their appointments. “We like that our office feels less like a clinic and more like a fun place of exploration for our patients,” Dr. Van Wingen says- appropriately so, given both his and Dr. Mandeville’s passion for adventure and travel. Several years ago, in search of a more practical location- as proprietors of one of the few pediatric practices in in northern Michigan, Drs. Van Wingen and Mandeville are accustomed to patients traveling hours to see them- the two adventurers ended up in a 14,8000-square-foot former law office with a 5,800-square-foot lower level. A painstaking five-month renovation was completed last November. A good solution, yes- not to mention a colorful, playful and outdoorsy one that suits Traverse City to a T.